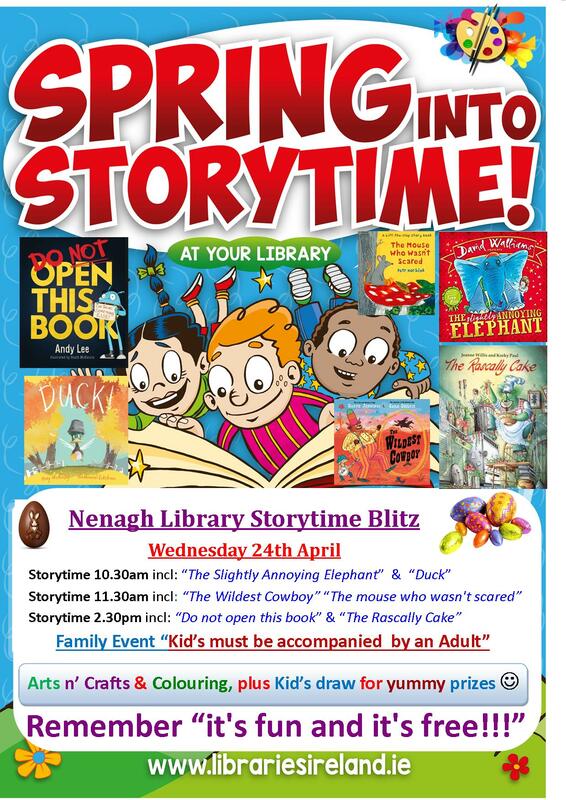 Spring into Story Time will take place in Nenagh Library on Wednesday the 24th of April. We will have Storytimes at 10.30 am, 11.30 am and 2.30 pm and the stories will include such titles as “The Slightly annoying Elephant” , “Duck”, The Wildest Cowboy”, “Do Not Open this Book” and many more. Colouring and Arts n’ Crafts will run throughout the day. We will also have a kids draw for yummy prizes! This is a free event and no need to book! This is a family fun day and children must be accompanied by an adult. See poster for full details. Spring into Storytime is organised by Tipperary County Council Library Service as part of its Right to Read Campaign. previous post: Spring into Story-time with Thurles Library tomorrow!